BELIZE CITY, Mon. 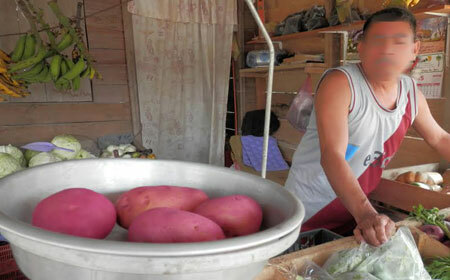 Feb. 23, 2015–In early February, the Belize Agricultural Health Authority (BAHA) and the Ministry of Natural Resources and Agriculture issued a joint statement warning Belizeans against purchasing potatoes of a hot pink color which had suddenly appeared on the market. Local authorities began confiscating the product, which was recently confirmed to be dyed Idaho potatoes. The Ministry of Agriculture confiscated 1,200 pounds of the fake red potatoes from major stores and supermarkets, but hundreds of pounds were apparently sold off to consumers at a higher market price than what the regular brown-skinned potatoes would have sold for. Although it was initially thought that someone had imported Mexican potatoes and dyed them in Belize – since it is not routine for Belize to allow the importation of red potatoes, which are produced locally – our newspaper was reliably informed today that a Belizean distributor bought the dyed potatoes in Chetumal, Mexico, from a supplier who died the imported Idaho potatoes specifically for the Belize market, so that higher price tag could be charged in sales to Belizean consumers. It is clearly a consumer rip-off, our official source indicates, since the purchaser could have sold the produce at a much higher profit margin. We have not received word of any move by authorities to prosecute the person or persons responsible. We understand that an official press release is due to be issued tomorrow, Tuesday. Authorities were alerted when Bart Mickler, owner of Maya Mountain Lodge in San Ignacio, filed a complaint after he bought the potatoes for his business, but later discovered that the “red potatoes” he had bought had been dyed.